MN ‘snowflake’ milsubs tend to get all the glory, however Tudor’s military history extends far beyond France. Ci engravings shown here mark “Cuerpo Infanteria.” Originally thought to be from Canada, a long forum discussion with confirmation from Tudor determined these to be a rare series of 7928s issued to the Argentine Infantry Corps. Production numbers remain unknown, but definitely substantially smaller than the desirable MN ‘snowflake’. The 7928 is lovely reference in and of itself. The first Tudor with a guarded crown, the 7928 utilized a well-finished Fleurier 390 powerhouse and that lovely rose on the dial. Military 7928s came first with the pointed guards, later evolving to squared edges for the US Navy. The zeitgeist, as I have noted previously, is that of humble beauty. Shown here with slightly marked plexi and fixed springbars, it’s downright gorgeous. Identifying original military Tudors is a minefield, in any reference. There is a particular serial number range that should be associated with each issue. One should contact Tudor to perform that due diligence. 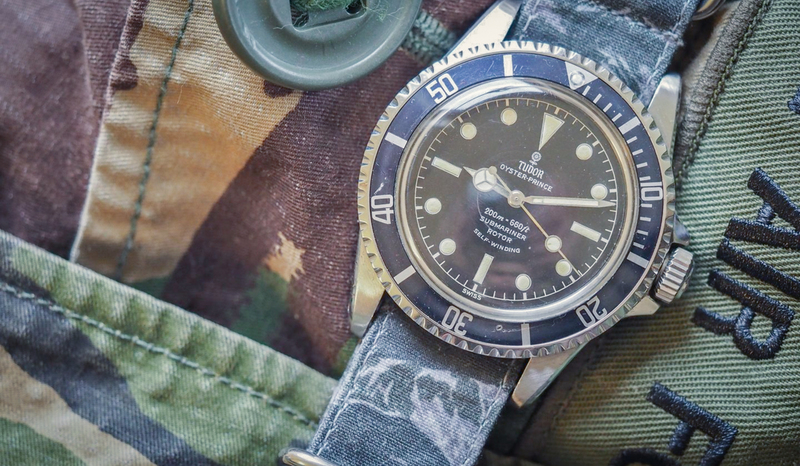 One thing that worries me slightly is the lack of wear, specifically of the hallmark ‘NATO grind,’ where used military pieces tend to see strap rub on the case back. However, it is possible that this example comes from military lineage and was simply lightly used. The fact that it comes from a well-respected vintage dealer does lend some credibility. If you’re interested seriously, that background research is half the fun. And so I leave it to you: a potential lifetime opportunity, gorgeous either way. Find it here for 22500 GBP.